DIY: Tissue Paper Ceiling ~Hides everything! | Oooh, I Could Totally Do That! 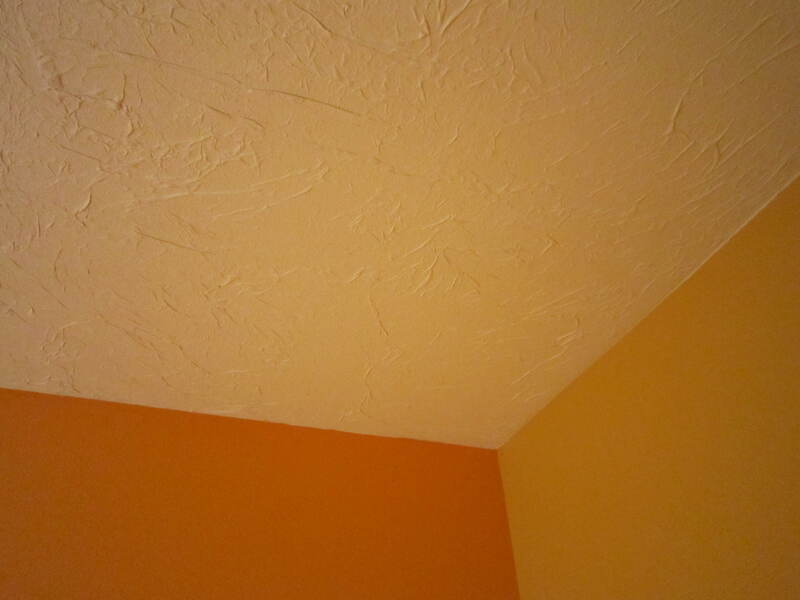 As you can see in this photo, the uneven ceiling texture is what I’m trying to cover with this tissue paper texture. FIRST, apply a nice layer of paint just a bit wider than the tissue paper width. Take a sheet of tissue paper and place on the ceiling. Then PAT it gently, letting the wrinkles come as they like. DON’T RUB or WIPE! You’ll tear the paper like I did at first. Roll the paint just over the edge of each piece and overlap each sheet just a tad so you don’t end up with blank frames around each rectangle. DON’T roll over the whole tissue sheet yet until it fully dries though, or THIS will happen…. 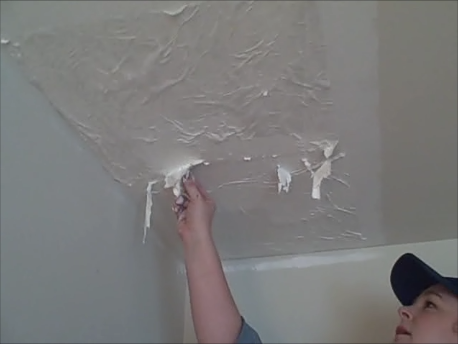 Once you finish your ceiling with the one layer of paint and one layer of tissue paper patted down, it should look something like this. A bunch of tissue rectangles that look like tiles. DON’T WORRY! Once you let it dry overnight, you’ll come back and put the final sparkly white coat of paint on and all this “tile looking situation” will disappear. These pictures were taken at night with poor light, but you can get the gist of how awesome the end result is! Fantazmo! This room took about 3 hours to do all together, including my mistakes. 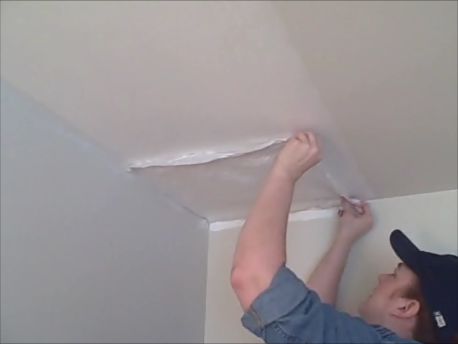 A great ceiling treatment all for under $20! Category : Do It Yourself...I Did! ← DIY Brown Paper Floor Awesomeness……Room #2 Complete with Mistakes! I could also be a good idea for a indoor to make faux suede look. Will try this for sure! Thanks! Best of luck with your project! You did an amazing job (and I love the sense of humor…a must have with DIY projects). I really wanted to try this technique. 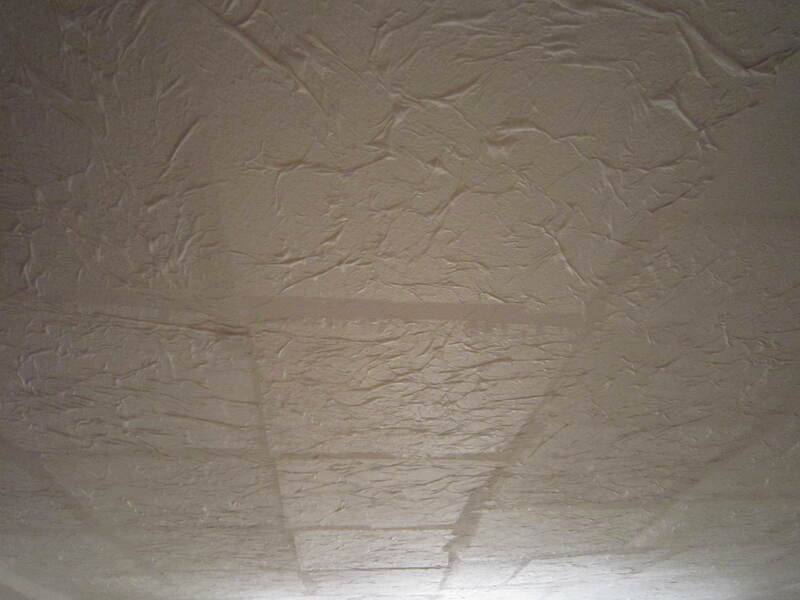 It’s hard to tell from the picture, but was your existing ceiling what’s considered a “popcorn” ceiling? Or is it a knock-down texture? I was just wondering because I have popcorn and I wanted to know if I need to shave it down first or whether I can just tissue over it. 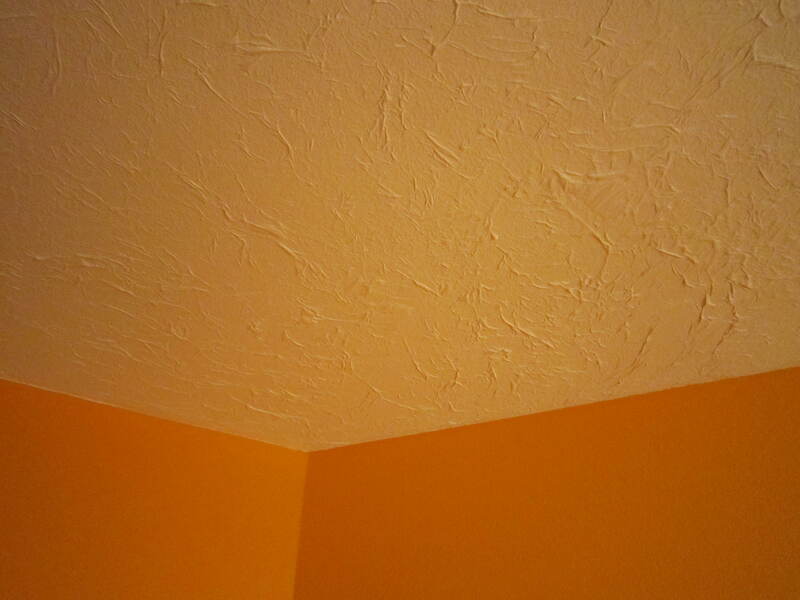 I had a plain ‘ol textured ceiling. I’d say more of a knock down texture or kind of an orange peel style. I would think the popcorn would need to be shaved off first to make this work. The paper gets super delicate and I’m afraid it would just end up looking like gloppy popcorn if you didn’t. Thanks for the comments! We where looking for a ceiling texture that would look different, found yours during web search. Scraped off the popcorn (not hard to do) and bought tissue paper and paint. Started in a corner, which took 2 sheets to get it squared. Once I had the first row completed along the wall, it went pretty quick. But it is a time consuming project. One thing I found out is that when you overlap the pieces you need to put paint on the first piece. I used a brush after I found out that using the roller pulled up the tissue. There are a few places where the tissue paper bunched up, I plan on letting the ceiling dry then go back and do repairs. Overall the ceiling looks great. I am looking forward to completing the ceiling and seeing what the finished project looks like. Would have never thought of using tissue paper on a ceiling, thanks for your posting. Hi, I love your videos & your candidness! You really encourage me to believe I can do these projects! I started tissuing the first layer of my ceiling today. 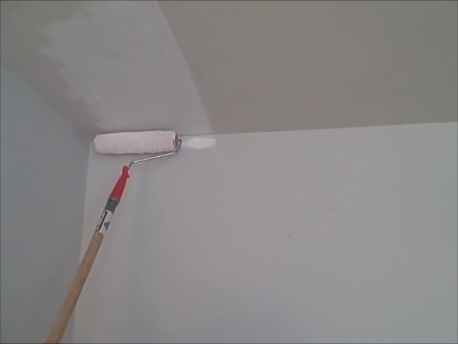 Tomorrow I will go over it with the first “cover layer.” But I am painting a color on my ceilings, as I see you did…do I need to do a plain white over the tissue, let it dry another day, and then do my color? (I am also doing a yellow). Or can I just cover the tissue with yellow, followed by a second coat of yellow? I am still a little nervous…it seems so fragile at first. I am kinda scared it will become soft again when I start adding more paint. Thanks so much! 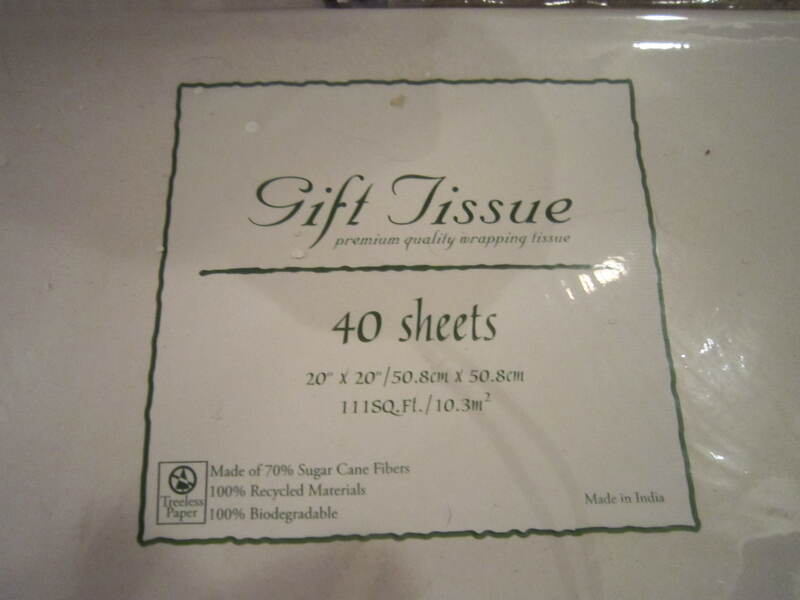 I would think that you could do the yellow right on the tissue. I would let it dry for a few days before doing the second coat though. 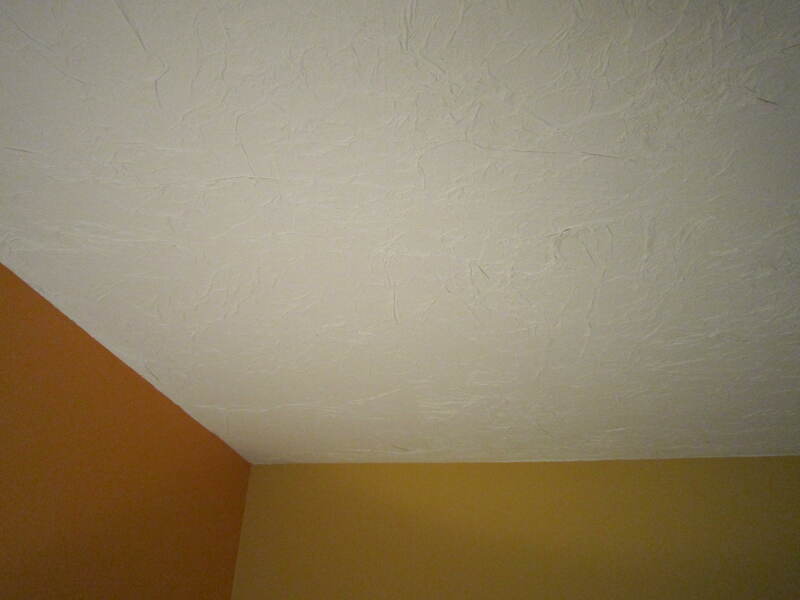 We have had to redo a portion of the ceiling from an upstairs pipe leak repair, and it repainted wonderfully. Good luck to you! Ugh! I’m so sorry I’m just seeing this comment! 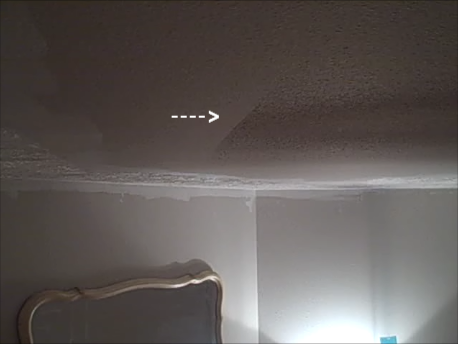 We have repainted parts of our ceiling since this original post (had to fix an upstairs leak that was seeping through the ceiling), and it went just fine. I’m not sure what exactly was going on for your situation. My only guess is that perhaps you were rolling over the area too many times? Or the paint was too thin? Or too thick? Or too much humidity when you put it up? 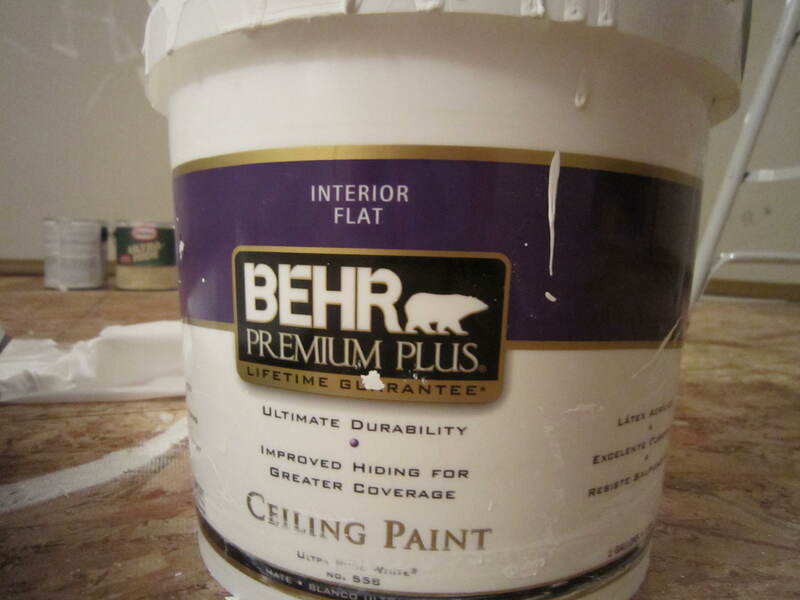 Or the wrong kind of paint? We used latex “ceiling paint” from Lowe’s. I’m sorry you had such a hard time with it. Ours is in our kitchen and dining room, so there is a fair amount of steam from cooking at times and doing the dishes with hot water. We haven’t had any issues with it peeling or coming off. Also, when the leak was seeping through from the upstairs shower, the only reason we noticed was a ring of brown staining on the ceiling, and the tissue/paint was still intact as if nothing happened. How did it all turn out? Oh my! I absolutely loved your video. Had me laughing so much because the same stuff happens to me when I try new projects! Thank you for being so real! How big was the room you did? How has this held up over time? Now that I’ve done a total of 5 rooms in my downstairs, I have discovered that each has experienced a wee bit different wear resistance. I ended up using two different poly coatings, and found that a slightly different technique for each also had an effect. The one room that I did redo was the living room, as the technique I used for it was rushed, in colder weather, and with a less durable poly than the rest of the other rooms. After that, they all held up really well for the 3 years that I had them. My intention was never to use them as a permanent floor covering solution, but merely as a temporary situation until I could afford to wood laminate floors to replace them. I just installed 2100sqft of laminate this spring for my upstairs and downstairs too, right over the paper floors, and the only room that I left the paper floors in was the powder room, which is the first room that I ever did with the paper floor technique. It is still in PERFECT condition. Not a crack, wrinkle, hole. Nothing. The only thing I had to be careful with in the other rooms was dragging furniture or anything sharp and heavy. Pets, little kids, and Pacific Northwest weather didn’t phase the floors for the 3+ years I had them. Just an occasional touchup with a Sharpie, and it was all good. We had a problem of the cheaper poly not adhering well in one corner of the front living room, but I just repapered over that part, restained and used the better poly, and it was all good after that.